Copper is a soft, ductile, and highly conductive metal that has been used by human societies since antiquity. Gold and meteoric iron were the only metals in common use prior to copper’s discovery circa 9000 BCE. This early use was facilitated by the existence of native copper deposits, which could be worked cold due to the softness of the metal. However, native copper is not particularly common, and eventually the process smelting of copper from ore was developed, which in turn led to the accidental discovery of alloying. Adding another metal to copper increases its hardness and makes it easier to cast, making the metal considerably more useful. This occurred initially through the smelting of copper ores that contained small amounts of other metals, often arsenic and silicon, to produce a natural bronze. Later, it was discovered that bronze could be produced intentionally by adding tin to copper melt. This advance occurred between 4500 BCE and 600 BCE in different regions of the world. Bronze production is now recognized to be such a key technological achievement that the period in any society between this discovery and the development of iron smelting is often referred to as the “Bronze Age”. The introduction of bronze allowed for the protection of harder, more durable metal tools and weapons. Bronze was so essential to civilizations of this period that history was shaped by the trade of the relatively rare tin ore necessary for its production. Though copper was easier to come by, its sources were also significant to ancient societies, and in fact lead to the naming of the element. In the Roman empire, copper was most often mined on the island of Cyprus, and the modern name of the metal is derived from the latin cuprum, which itself was derived from cyprium, meaning “metal of Cyprus”. Though for many uses, alloys have preferable properties to pure copper metal, architecture has made use of elemental copper since ancient times. The patina that the metal develops over time provides a natural coating that makes it extremely durable and low-maintenance, and its malleability lends it to being molded into desired shapes. Today, copper in architecture is most often seen in roofing, flashings, rain gutters, and downspouts. Metals other than tin came into use for alloying with copper later in history, especially nickel and zinc. Brass, an alloy of zinc and copper, is more malleable than either individual meta, easier to cast and has excellent acoustic properties. Initially, brass was used in coins and for decorative purposes, while today it is used extensively in brass musical instruments, for plumbing and electrical applications, and in applications such as lock where low metal-on-metal friction is required. Cupronickel alloys, including ancient Chinese paktong and european nickel silver or German silver, were initially used in a variety of applications, and still find use in the production of coins, plumbing fixtures, and musical instruments. Copper is also found in some gold alloys and in sterling silver. In addition to using copper and its alloys widely for tools, instruments, currency, and building materials, ancient societies took advantage of copper for its antimicrobial properties. Though the ancient Egyptians did not understand that the copper was preventing the growth of microscopic organisms, they did recognized that water stored in copper vessels went foul less frequently, and that wounds dressed with copper tended to heal better. Today copper is still used in this capacity in a variety of settings, most notably hospitals, where coatings of copper on frequently-touched surfaces helps to limit the spread of disease-causing organisms. Current applications for copper make frequent use of one of its properties that was not of particular interest for most of our history: electrical conductivity. Copper can be easily drawn into wires, and is the preferred electrical conductor for most wiring applications--roughly half of all copper mined is used in this way. In addition to being highly conductive, copper has high tensile strength, low thermal expansion, and resists corrosion and creep, properties which together result in reliable circuitry. The high conductivity of copper also enhances the energy efficiency of electric motors. Copper is likewise found in electronic devices such as electromagnets, vacuum tubes, magnetrons, and microwaves. Heat sinks and heat exchangers in electronic devices also sometimes use copper, as it dissipates heat more quickly than the most common alternative, aluminum. Copper compounds also have many notable uses. Copper oxides and carbonates are used in pigments and glassmaking, and copper sulfate can be used as an herbicide, fungicide, and pesticide, as well as a chemical reagent in organic synthesis. Several copper compounds are semiconductors, including copper (I) oxide, one of the materials in which many semiconductor applications were first investigated. Today, copper semiconductors mostly find use in thin film solar cells. Copper can also be a component of high-temperature superconductors, and copper is used frequently in organic synthesis as a catalyst. Naturally-occurring metallic copper has at times played a significant role in commercial supply of the metal, but most copper is found in sulfide, carbonate, and oxide minerals. Copper sulfides are the major copper ore, and after separation from iron and other unwanted material, these are roasted to produce the oxide. Copper oxide is then converted to blister copper through heating, and further purified through electrorefining. Copper is also recyclable without any loss in quality, and is the third most recycled metal after iron and aluminum. Copper is used as a building material, a conductor of heat and electricity, and as a component of various metal alloys. Due to its high electrical conductivity, large amounts of copper are used by the electrical industry for wire. Since copper is resistant to corrosion caused by moisture, it is widely used in pipes, coins, and jewelry. Copper too soft to be used alone in most applications, so it is instead incorporated in numerous alloys. For example, brass is a copper-zinc alloy, and bronze is a copper-tin alloy. Copper sulfate (CuSO4· H2O), also known as blue vitrol, is the most well-known copper compound. It is used as an agricultural poison, an algicide, and as a pigment for inks. Cuprous chloride (CuCl) is a powder used to absorb carbon dioxide (CO2). Copper cyanide (CuCN) is often used in electroplating applications. Copper is available as metal and compounds with purities from 99% to 99.999% (ACS grade to ultra-high purity). Elemental or metallic forms include pellets, rod, wire and granules for evaporation source material purposes. Copper nanoparticles and nanopowders are also available. Oxides are available in powder and dense pellet form for such uses as optical coating and thin film applications. Oxides tend to be insoluble. Fluorides are another insoluble form for uses in which oxygen is undesirable such as metallurgy, chemical and physical vapor deposition and in some optical coatings. Copper is also available in soluble forms including chlorides, nitrates and acetates. These compounds can be manufactured as solutions at specified stoichiometries. Copper is a Block D, Group 11, Period 4 element. The number of electrons in each of copper's shells is 2, 8, 18, 1 and its electron configuration is [Ar] 3d10 4s1. The copper atom has a radius of 127.8 .pm and its Van der Waals radius is 140.pm. In its elemental form, CAS 7440-50-8, copper has a red-orange metallic luster appearance. Of all pure metals, only silver has a higher electrical conductivity. Copper was first discovered by Early Man. The origin of the word copper comes from the Latin word 'cuprium' which translates as "metal of Cyprus". Cyprus, a Mediterranean island, was known as an ancient source of mined copper. Copper is an essential trace element in animals and plants, but in excess copper is toxic. Safety data for Copper and its compounds can vary widely depending on the form. For potential hazard information, toxicity, and road, sea and air transportation limitations, such as DOT Hazard Class, DOT Number, EU Number, NFPA Health rating and RTECS Class, please see the specific material or compound referenced in the Products tab. The below information applies to elemental (metallic) Copper. 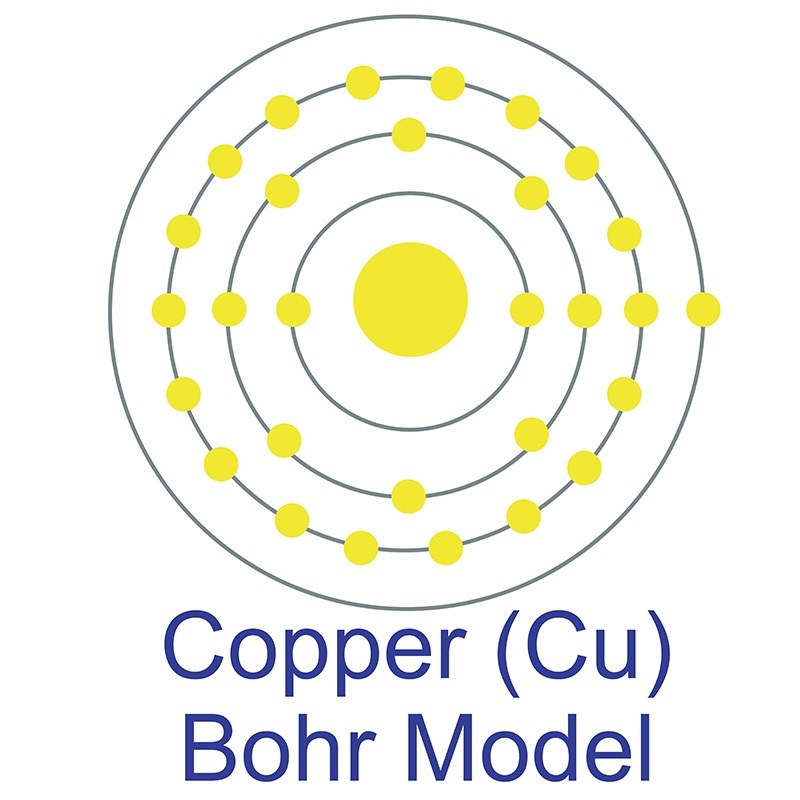 Copper has two stable isotopes, 63Cu and 65Cu.